Home > Different Courtrooms > What Happens at the Coroner's Court? 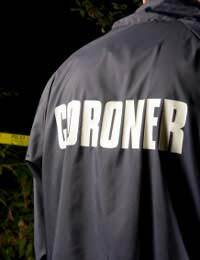 A coroner is a specially trained doctor or lawyer who in certain circumstances investigates the cause of someone’s death. The coroner becomes involved after a death in the following circumstances: if the death was violent, in suspicious circumstances, in prison or police custody, was caused by an industrial disease, while a patient was having an operation, or if the deceased was not previously ill or had not seen a doctor within 14 days before the death, or the cause of death is unknown or uncertain. In such situations, a post-mortem operation is usually necessary to establish the cause of death. One of the deceased’s doctors can ask relatives for this permission. Alternatively permission is not required for the coroner to order this to take place, although the family’s interests can be represented by a doctor at the post-mortem. If the post-mortem examination does not reveal the cause of death, or in certain other circumstances (industrial disease, violent or unnatural death, or death in prison) there will be an inquest. An inquest is a hearing that determines the cause of someone’s death. This hearing is held in public. Whether or not there is a jury will depend on the interests of the relatives and whether a jury is ‘in the public interest’. Generally, an inquest will be heard by a jury if the death occurred at work, in police custody or prison or if there is a risk that further deaths could occur in similar circumstances to the death in issue. It is important to note that an inquest is not a trial. An inquest establishes the identity of the deceased; how, where and when the death occurred but not who (if anyone) was responsible for it. Blame for the death is determined at a trial in the applicable civil or criminal court, not at the inquest. The coroner has to inform certain people about the inquest: the next of kin, whether a husband, wife, civil partner or other person, and (if applicable) the personal representative. If there is likely to be a claim for compensation (e.g. death after an accident at work or on the road) it is important that the relatives are legally represented at the inquest. If there are criminal charges to be heard in relation to the death, the inquest should normally be determined prior to the court proceedings. The criminal proceedings may be in the Magistrates’ Court (for example, in relation to a charge for careless driving) or in the Crown Court (for example, for a charge of murder or manslaughter) or be subject to an appeal in one of the higher courts. The inquest is not dependent on the outcome of civil proceedings, although evidence given at the inquest or in criminal proceedings may be of assistance in subsequent civil claims for compensation. In order to determine the circumstances surrounding a person’s death the coroner may require witnesses to be called to give their account at the inquest. These witnesses must attend, and can face penalties for not attending. A coroner will generally open an inquest and adjourn it for the police and other authorities to gather evidence and other information about the circumstances surrounding the death. The hearing is held at a later stage. Once the coroner or the jury if applicable has determined the facts surrounding the death. open verdicts are returned if there has not been sufficient evidence to prove any other verdict. If you disagree with the outcome of the inquest, there are certain circumstances in which you can challenge the coroner’s decision or verdict. An application for judicial review can be made within 3 months of the inquest, but this is a specialist procedure which requires consultation with a lawyer. A fresh inquest can be held at any time. My friends father was killed by a hit and run driver, the person responsible Was eventually arrested, but only for driving under the influence of alcohol, and pleaded guilty to that spedifice offence. He said that he had hit a wheelie bin. The case went to coroners court andseveral witnesses reported seeing the incident. The family are trying to get the paperwork from the coroner, are they legally entitled. To the documents. And how do they go about getting them, they need them for insurance purposes. @Dury - you're fine if the police and coroner have no reason to suspect his death was anything other than by natural causes! I looked after an elderly man. He changed his will in july. In August he was sent to hospital and died 10 days later. No I have to attend an inquest. Do I have anything to worry about. To the lady who's son died from falling off of a balcony. I feel your pain I'm in a very similar situation. My son was celebrating Arsenal winning the cup final with his friend. Then at midnight left to walk home. CCTV shows him in the pub leaving pub and again on his way home somehow this stranger who is married to a man invites him back to his flat played an already drunk man with more booze this man was arrested on suspicion of murder stating no comment my son would be alive now if not for this man. I am sorry to hear of your daughter's death. If you are concerned about the circumstances surrounding her death then you should consider seeing a solicitor. Please see the Inquest link here which should tell you all you need to know. I hope this helps. My Aunties inquest next month, she was found dead outside her flat early hours of the morning her top floor 4 storey flat window was open at the time of death. (She was petrified of heights) She was trying to detox off alcohol someone was in her flat apparently sleeping at the time that she was ment to of through her self out of window.Autopsy has come back no alcohol which is strange for her and drugs which she would never take as she was soo antie police made so many mistakes and not done anything to investigate now looking at it as suicide and toxic at time Need advice really can't but this to bed as not happy if this is the final out come. My son aged 28 died on the 28th October . The circumstances are very suspicious . 3 men who were in his apartment are saying he was acting strangely high as a kite and jumped off his balcony. This is absolute rubbish. Number one autopsy has given a full clearance for 0% drugs. He had been making plans that evening for the next few days and going back to america. He asked a girl up to his apartmentfor the evening. He wasn't talking to his flat mate wasn't happy with him at all yet his telling police him and my son were great mates. The other guy has also come up with a load of rubbish. The third guy is not answering police messages to come in and make a statement. I'm chasing London police constantly that if it was not so seriousit would be laughable. My son loved life to the max . So the police havevsaidvit wasn't suicide!! Never in a million years. And it wasn't drug related . I want the police to do there job for my sons inquest . He cannot speak for himself so as his mother I must do this last thing for him. My gut fielding and what is coming out tells me this is murder. A fight had broken out and got out of hand.? I just wished they would pull there finger out investigate my sons death as shouldbe done. He maybe a number to them but his my son. And I want to knowe that after returning home 32 minutes later he was dead . My mother died when the surgeon put a mechanical heart valve in upside down ! He re used a valve against manufacturers warning instructions causing horrific damage to her heartresulting in her death ! !The hospital and doctors covered it up and it took five days to find out about the valve !! Its disgusting that these people who have lives in their hands can be so dishonest andcover their own backs ! !I class this as evil at work !My heart goes out to everyone who has and is suffering through losing someone they love this way ! !Im not going to give up trying to get justice for my mother !